Purchasing Your New Steel Structure. By choosing Aussie Made Garages and Barns Pty Ltd you can rest in the knowledge that we are 100% committed to high quality, cost-effective constructions and are authorized dealers for Fair Dinkum Sheds and SOL (Solutions for outdoor living). We offer a comprehensive range of outdoor steel structures, including American Style Barns, Garages, Patios and Verandahs, Industrial / Commercial sheds, Buildings and warehouses, Quaker Barns, carports, Double Garages and Farm Buildings. Take pride in the knowledge that you are purchasing an Australian made and owned product, from a registered building practitioner, and using high-quality BlueScope steel. Whatever your needs, Aussie Made Garages can accommodate. We have highly trained staff at our office that can run through all the aspects of building your dream garage or barn. Let them guide you step by step, from size, design and colors to plans and permits, even the concreting and building can be organized all under the one roof. Aussie Made Garages and Barns Pty Ltd is a family owned and run business. 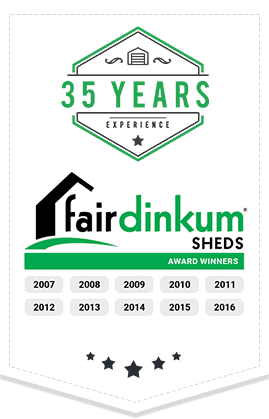 With over 30 years of experience in the garage industry we have the advantage of being able to custom design your structure to your individual needs and specifications.With display sites at Lilydale office we pride ourselves in our great knowledge and customer service, having received the award of Fair Dinkum Sheds highest shed sellers for over 8 years in a row, you can be assured our staff definitely know their Products. From your initial quotation, right through to construction, you can be sure of excellent service & advice. Obligation free quotations to suite your needs and budget. WE ARE REGISTERED BUILDERS. Please be aware of other companies that are not.